With the Link Aggregation enabled, Synology DS1512+ delivers an average 194.83 MB/sec writing speed under RAID 5 configuration in a Windows® environment, and 200.31 MB/sec reading. Coming with USB 3.0 support which offers transmission speeds of up to 5 Gbps, namely 10 times faster than USB 2.0, DS1512+ takes less time for data transfer for external hard drives and consumes less power. SKU: DS1512+10TB55 Category: Ultra High Performance Expandable 5 Bay NAS Servers. With the Link Aggregation enabled, Synology DS1512+ delivers an average 194.83 MB/sec writing speed under RAID 5 configuration in a Windows® environment, and 200.31 MB/sec reading. Coming with USB 3.0 support which offers transmission speeds of up to 5 Gbps, namely 10 times faster than USB 2.0, DS1512+ takes less time for data transfer for external hard drives and consumes less power. Synology DS1512+ brings you the high performance that your data-intensive applications demand for a storage system, and offers the ability to scale the storage capacity. Reliable functioning of commercial systems is of paramount concern to business users who depend on these servers every day. Synology DS1512+ is now introduced with the fanless CPU heatsink to prevent the single point of failure. With the CPU passive cooling technology, Synology DS1512+ achieves the high reliability system design. When one of your system fans malfunctions, the built-in system fan redundancy mechanism can extend service uptime by keeping the remaining fan running and your DS1512+ performing basic operations until the replacement fan arrives. The 2 LAN with failover support and hot-swappable drives will ensure continual service uptime should the drives need replacement or the unexpected LAN failure occurs. Business need a strong foundation to face mission-critical tasks so the Synology DS1512+ delivers high reliability ensuring data access when it is needed. When the storage capacity of the Synology DS1512+ is nearing its limits, it can easily be expanded with the Synology DX5102. The Synology DX510 securely connects to the Synology DS1512+ via an eSATA cable of specially-designed connectors on both ends to ensure maximum throughput. 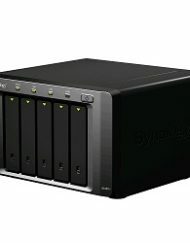 The Synology DX510 can directly expand the existing storage on the Synology DS1512+ to a maximum 60TB capacity. With the iSCSI support in DSM, the Synology DS1512+ provides a seamless storage solution for virtualization servers, such as VMware, Hyper-V, and Citrix. It is the ideal alternative to SAN solution for businesses. Affordable and cost-effective, iSCSI allows SMB users to consolidate storage into data center storage arrays while providing hosts with the illusion of locally-attached disks. The Synology DS1512+ runs on the renowned operation system, Synology DSM, offering applications and features designed specifically for SMBs. Comprehensive network protocol support assures seamless file sharing across Windows, Mac®, and Linux® platforms. Windows ADS and LDAP integration allows the Synology DS1512+ to quickly and easily fit in an existing business network environment with no need to recreate user accounts. Directory Server package can turn DS1512+ into an LDAP-based directory server within minutes. IT administrators can bind other DiskStations to the directory server. With the same batch of directory user accounts or groups, employees can access all the DiskStations with the same user credentials. Windows ACL support on DS1512+ provides much finer-grained access control and efficient privilege settings, allowing IT staffs to set up privileges to files and folders on DS1512+ through their familiar Windows user interface. The privileges set on Windows ACL will be applied to all access entries, including AFP, FTP, File Station, NFS and WebDAV. The secure privilege offers IT staff peace of mind, no worries about any loopholes. Internet file access is simplified with the included encrypted FTP server and the web-based file explorer, Synology File Station. HTTPS, the built-in firewall, and IP auto-block support ensure file sharing over the Internet is protected at a high security level. A wealth of additional features allows the Synology DS1512+ to replace several pieces of network hardware. Synology Web Station with support for PHP/MySQL® content allows for the hosting of up to 30 websites on a single Synology DS1512+. Synology Surveillance Station offers a centralized interface to safeguard the office environments by deploying IP cameras throughout the network. The built-in mail server turns a Synology DS1512+ into a dedicated mail service provider and the USB printer sharing capability minimizes businesses’ printing cost by sharing printing resources throughout the office. Synology DiskStation are designed and developed with energy efficiency in mind. 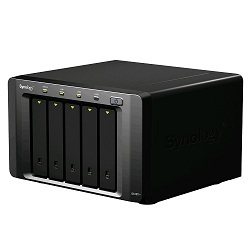 Compared with the average PC counterparts, Synology DS1512+ consumes only 50.6 watts in operation. The support of wake on LAN, scheduled power on/off and hard drive hibernation can further reduce power consumption and operation cost. All Synology products are produced with RoHS compliant parts and packed with recyclable packaging materials. Synology acknowledges the responsibility as a global citizen to continually work to reduce the environmental impact of every product produced. 2. 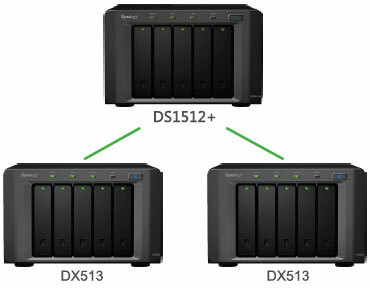 DS1512+ supports up to two Synology DX510, purchased separately.